The Toyark › Toyark Spotlight › Discussion Point – Sealed In Package or Open and Play? Discussion Point – Sealed In Package or Open and Play? It’s the age old debate in the collector world: open your collectibles, or keep them mint in sealed package? A recent thread has popped up, started by Toyark member quipp209 posing this same topic to our very message board. This is a great opportunity for a new Toyark Discussion Point! So tell us, what is your preference? 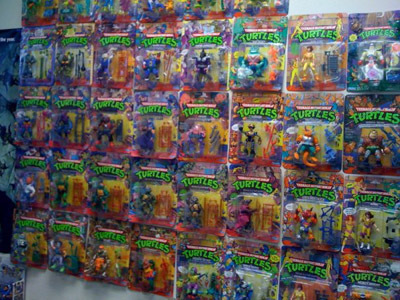 Do you like to keep your toys and collectibles sealed in their packaging? Do you like to keep your items unopened and mint? If so why? Is it for potential resale down the road or do you like how they look better in the packaging? Or do you get home and rip open the package and spend hours posing and playing with your new toy? Some of you may even buy 2 of any given collectible, one to open and one to keep sealed. We want to hear from all of you! Sound off in our thread and let us know where you stand and why! Discuss on the Toyark Forums› Views: 3596 › Credit: quipp209 of the Toyark Forums! Well I just wanted to know how people prefer there collection do you like you figures in package? If so, why? Are do you like to open them up? Open most, if not all. Doubles would be the only exception to that "rule", they remain sealed. I cut the bubble off of the card, throw the bubble away and file the cardback away, keep the instructions and useless (or easy to lose) accessories in seperate freezer bags. Anything bigger then a deluxe, the box gets chucked. Unless it's something expensive, like third party for instance. I keep all of that packaging no matter how small. IE: Headrobots Blood or the classics Starscream coronation set are some that some to mind. 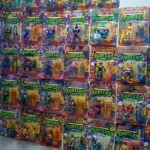 Other toylines (DCUC, Predators, etc.) I do the same if it is on a card, if not, gar-bage. I open some. I've left others MOC. Some figures loose their luster once they've been opened, due to poor quality (arms/legs pop off, or worse) and honestly I don't always like to display MU because there are just too many of them. It is too damn much to keep track of anymore. I'll admit that does look hella cool... but I'm still pro freedom. its a goddamn toystore in there. Also, you need more posters, i see some naked wall. 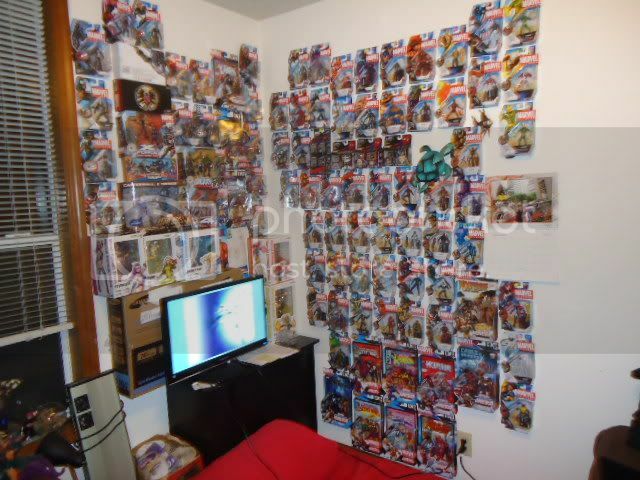 But seriously awesome collection man. This pretty much sums up my thoughts as well. For TFs larger than deluxe-class, I will usually cut out the back side of the box, especially if it has a bio, stats or some other character info on it. Those get filed with the other cardbacks and instructions. And I hang onto any packaging for exclusives, even if it's just a white mailer box (helps with storage/moving). How the heck do you 2 keep them organized, and know which figures are where :P??? i used to go MOC, but once i had room to display them and set them free, i never looked back. i literally only have x4 MU still on card... vintage Takara Firefly MOC, and vintage Cobra Commander on Chinese card. all displayed in acrylic cases. Wow, that is awesome. Can I come over and play? I heard wolverine2281 likes wolverine.